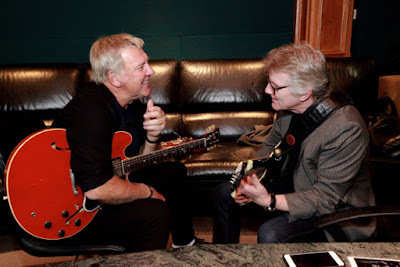 Rik Emmett is joined by Rush guitarist Alex Lifeson on “Human Race”, a track from the former Triumph frontman’s forthcoming album, “RES9”, now streaming as a lyric video. “When Rik asked me to play on his new album, I didn’t hesitate for a second,” explains Lifeson. “He’s the consummate musician, a wonderful guitarist, and a terrific person, and it’s always my pleasure to work with him any chance I can get. Due November 11, the project by Emmett and his touring band Resolution 9 – featuring guitarist Dave Dunlop, bassist Steve Skingley and drummer Paul DeLong – delivers new music with the help of guest appearances by Lifeson, Dream Theater’s James LaBrie and a reunion with Triumph members Mike Levine and Gil Moore. The Triumph appearance on the bonus track, “Grand Parade”, marks the first time the trio have reunited on record in three decades following Emmett’s split from the group in 1988.